This review about the LeYou 16800mAh power bank is originally a part of my Lazada Philippines experience. 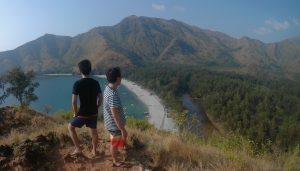 I decided to create a standalone post for the product review to create a better emphasis about this LeYou power bank. 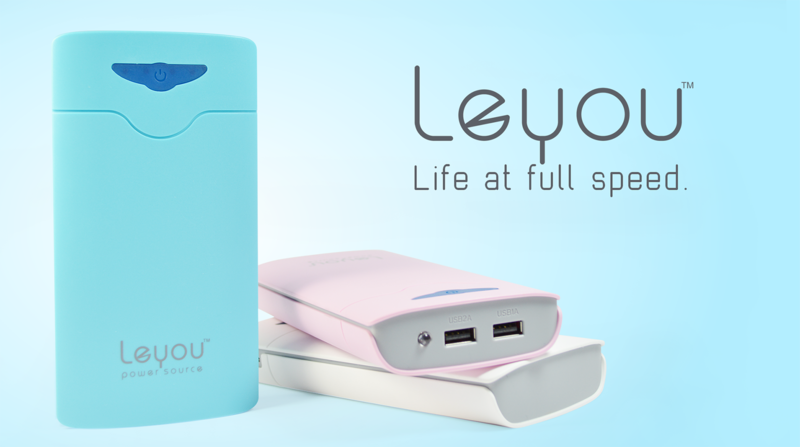 LeYou is another player that joins the tight competition in the power bank market. It is still again a Chinese company that has physical stores in mainland China. 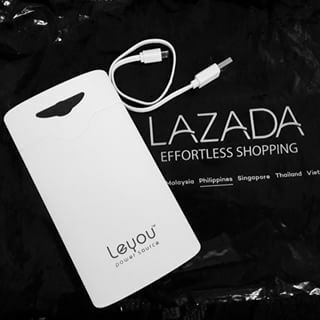 Lazada offers the LeYou 16800mAh power bank variant in sub-1K price so it gathered a great attention of online buyers. On the product description, it says that this unit has 7 levels of protection like over-voltage, overcharge, current surge,overdisharge, undercurrent, temperature sensitivity and short-circuit protection. It also says that this LeYou power bank will save you from the misery of having a 1% battery that is slowly fading away (How come that it slowly fades?). Quality is a part of the company DNA so that a premium service will be given to customers, day to day to build a long lasting relationship. 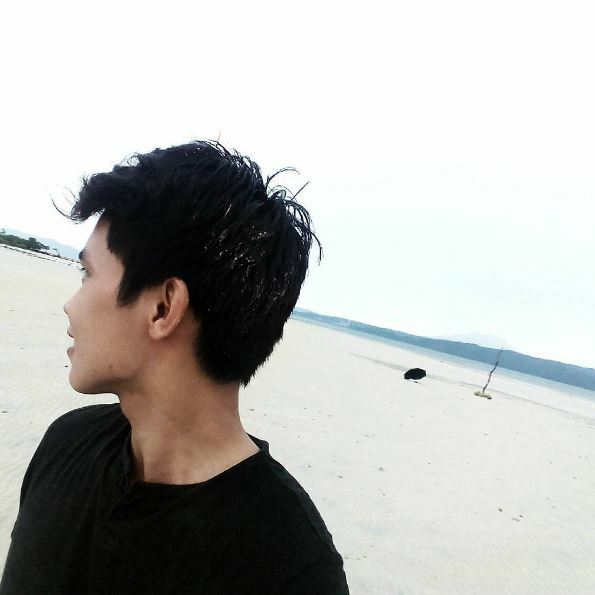 The marketing strategy is really good and it will definitely make you buy the product. Do these claims hold true? Let’s find out. The item arrived bubble wrapped to protect the box of the product. There is nothing special about the packaging of the power bank.The box is built with a transparent plastic material that feels like a generic pack you can get in a street stall. It contains a hologram security sticker on the upper left and right corner of the packaging. As usual, it indicates the product name “LeYou Power Source” in front and specifications on the back. Note: I am sorry to tell you that I do not have any actual photo of the product as I returned it immediately to Lazada’s warehouse. Photo from: weloveshopping.com. 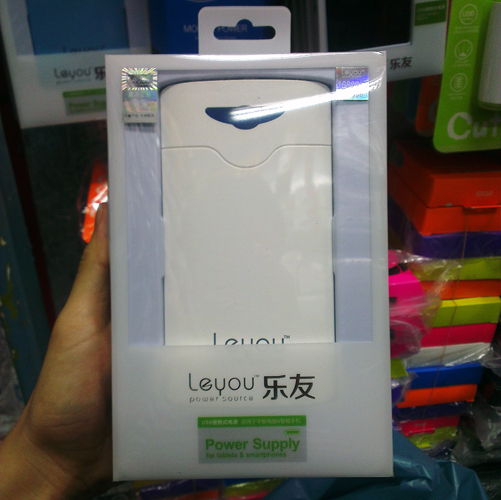 This is the exact packaging of the LeYou 16800mAh power bank. The box contains the power bank, a user manual and a short micro-USB cable for charging your gadgets. Unlike other power banks, LeYou decided to bundle a flat type cord instead of the usual rounded cable. It looks neat and elegant but too short to manage charging a device while still using it during travel. 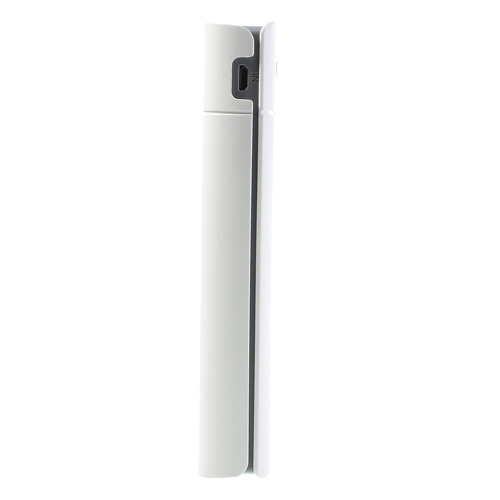 Unlike the poor plastic packaging, the material used in the power bank chassis has a premium and stylish look. It feels solid and durable. Despite of being stylish, it has a bulky appearance. It weighs about 350-400 grams and it is a little bit heavy for a typical Lithium Ion power bank with a 16800mAh capacity. The front side of the power bank has a blue eagle wing-like design on the upper area. It contains the power button/switch and 4 led indicator for battery percentage. A plain grayish print “LeYou Power Source” can be found on the lower side of the product. Undoubtedly, it has an elegant look compared to those generic power banks in the market. However, mine already had some scratches-like and smudges in front. It is not that noticeable but annoying. 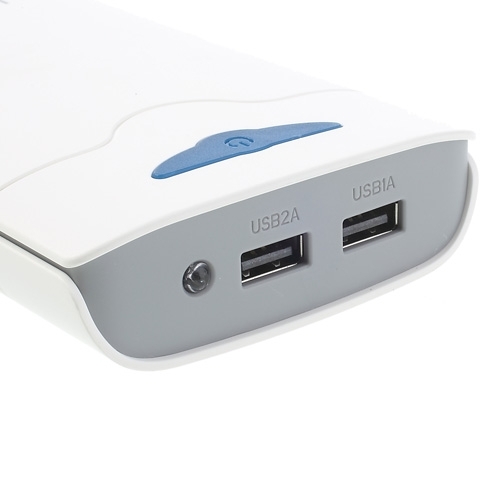 The power bank has two USB ports located on the top side of the product. These ports can supply 1A and 2A current each. Beside the 2A port is a led flashlight that is extremely handy for situations that you need an emergency power. It is not that bright and you can notice some dimmed portions of light (light projected had some blocked areas). It is how the LED was placed probably. The LED light can be turned on by pressing the power button twice. A microUSB port meant for charging the pack is located on its upper left side. You should note that this LeYou model can only accept 1A 5V current at maximum. It is a major drawback for some as a power bank with a high capacity like this one should be filled to full capacity fast. The power bank is obviously not on the “thin profile” market as it boasts a 2.6cm thick body. It is like a three regular smartphones piled on top of another. Also, the power bank is relatively large compared to its counterparts. One thing that caused this bulky profile is the excessive use of thick plastic to support the batteries inside the power bank. The compartment can be revealed easily by removing the front cover using your nails or a thin card. 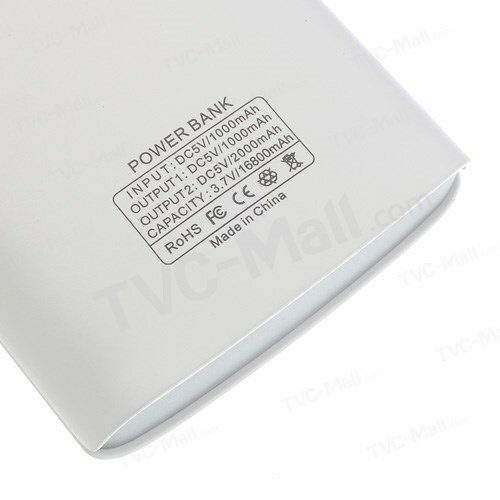 Basic information about the power bank can be found on the lower corner of the power bank’s back side. As stated awhile ago, this unit has two USB ports. Thus, it supports charging of two devices simultaneously. In principle, the 1A port should be use for a smartphone while the 2A port is pretty good for a tablet device. It says that it automatically detects what current is the most suitable for your device whatever port you connected it. Theoretically, this feature works even the power bank manufacturer does not indicate such thing since a smartphone itself do not accept amperes (A) higher than what it can handle. For example, a typical phone charges its battery using a 550mA to 1A adapter. If you use a 2A adapter for the same phone, there is a high probability that the phone can’t accept 2A but will only draw what it needs — 1A or lower. Despite of the manufacturer’s claim, my tests do not show any proof that it supplies 2A to any device I tested. The 1A port can hardly give 1A output and it is only around an estimate of 800mA. Charging cycles took longer compared on using the supplied charging adapter of my devices. I also tried using another cable but no luck. Charging the pack only take about 10 hours whether I use a 1.5A or 1A charger. It is below the claim of 16-18 hour charging time indicated in the user manual. Also, the unit gets too hot when it is under operation (both charging and discharging). This may indicate a poorly built and/or malfunctioning circuitry that result to a terrible loss of energy capacity generated through heat. The power bank automatically turns off when a device/s connected is/are already fully charged. However, it doesn’t turn on automatically when a device is plugged in. The led indicators seemed to be inaccurate as the light drops from 3 to 2 faster than what it does from 4 to 3 lights. LeYou claimed that this model has 16,8000mAh total capacity. In theory, it should give at least 10,000mAh of actual output. This output should fully charge a Samsung Galaxy S5 4 times. To know how to compute for actual total output, please check How to Compute Real Capacity. As you can see, the LeYou 16800mAh power bank performed poorly in this case. In thoughts of having a fake item, I scratched off the hologram sticker in the packaging. A security code is revealed and I verified it on LeYou’s website. The verification tool says that I have a genuine item. In that moment, I am thinking that I had got a defective one. The LeYou 16,800mAh Power bank performs below the average acceptable efficiency for mobile power banks. It looks stylish and has a premium built but it does not deliver what it supposed to. From ₱ 909.00 BUY NOWI sent the unit back to Lazada after a few days and I demanded for a replacement. However, the replacement request is not granted and they refunded my money instead. Checking the reviews posted in the product page, I am not the only one who experience low actual output for the product. 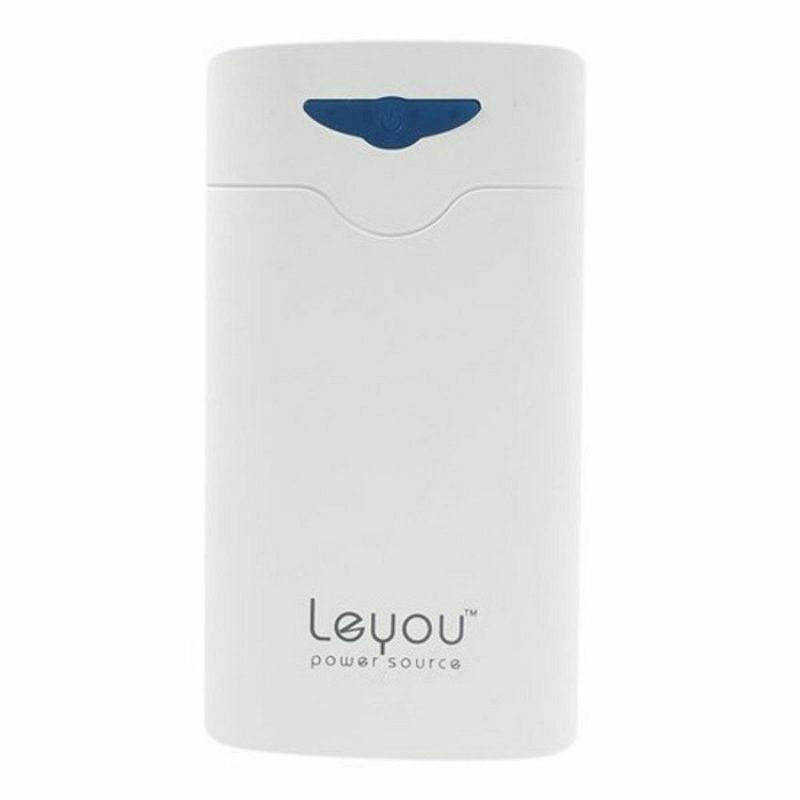 However, there are also positive reviews that the users are happy about the LeYou 16800mAh power bank performance. Is LeYou 16800mAh a good deal? The power bank currently sells for P909 in Lazada. Considering the low price and the actual capacity you get, it is still a good deal but not a smart choice.